Many times in the pursuit of our goals, we hit brick walls that stop us from advancing. This is especially so when what we are trying to achieve is bigger than what we are capable of accomplishing at the point. What is level up? It’s a concept that I learned from games. If you have played games like RPGs before, you will be familiar with it. 🙂 In RPGs, it is normal to enter a new section of the game where you can’t proceed because your characters are not strong enough to defeat the enemies. This happens when the new enemies you are fighting are much stronger than the ones you’ve fought before. At this point if you insist on progressing, you’ll probably get killed and have to return to a nearby inn to rest. So what do you do now? Do you stop playing? Of course not! The next step is to train and level up your characters. 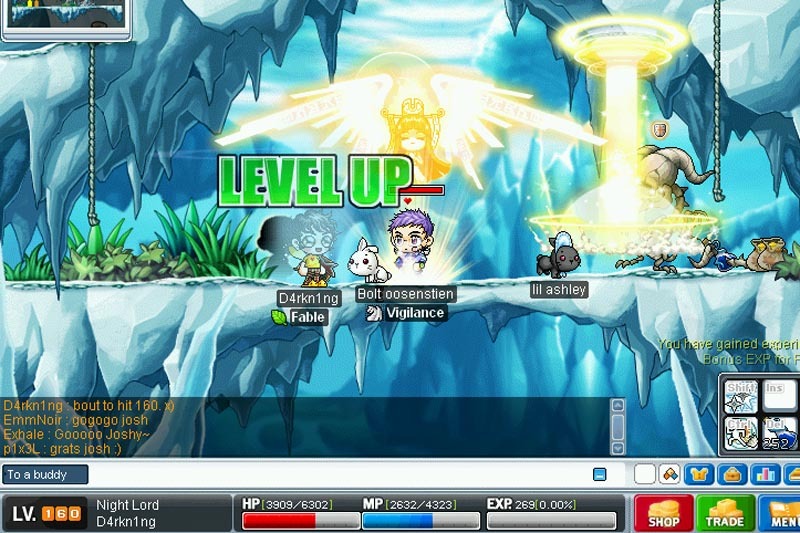 When your characters level up, they gain an increase in their stats, such as HP (hit points = your health bar. the more HP you have, the more damage you can withstand), strength, defence, dexterity, and so on. Sometimes leveling up results in the characters acquiring a new special move/technique (or limit break for those of you Final Fantasy fans) that makes them much more powerful than before. 😀 With their increased powers, defeating the new enemies becomes a piece of cake and you are now able to advance to the next stage of the game! So how does this apply to real life? When you face obstacles in a goal, obstacles that you’re not able to tackle at this moment, it just means that the goal is currently bigger than you. What you should do then is to level up. Level up such that you become stronger, better, and smarter and you are able to conquer these obstacles consequently. In games, you level up by fighting weaker enemies, gaining experience points (XP), and accumulating your XP such that you hit the next level. The more XP you gain, the more levels you gain. The more levels you gain, the stronger you become. Mirroring this to real life, this means you should tackle a smaller version of your goal first. Tackle it and become great at doing it. As you do so, you’ll gain XP, which then helps you level up. If you want to be a great coach, start by coaching people around you first. Get good at coaching them before you look at doing this at a professional level. Read: Are Coaching Courses Necessary To Be a Coach? If you want to be a great artist, start by mastering simple artwork. If you want to be a great programmer, start by developing simple software that solves simple problems. If you want to build a traffic of 10,000 visitors per day but your blog is new, start with 100 visitors first. Master having a traffic of 100 visitors/day, then look at a higher tier like 200 visitors/day, followed by 500 visitors/day, etc. If you want to earn $10,000 a month, work on earning $5,000 a month first. If you’re not earning anywhere near $5,000 a month, then aim for a target that’s 10–20% higher than your current income. If you want to earn passive income of $X, master earning an active income of $X first. Earning passive income is significantly harder than earning active income, something I taught my students in my passive income course. When that happens, it’s time to up the ante. 😀 Instead of playing in your current sandbox, you are now ready to move on to a more challenging goal! That’s because when you keep working on the same old goals and the same targets you’ve already achieved, you don’t grow. You can only stay at the same level. By progressing to a bigger goal, you (1) push yourself out of your comfort zone and (2) stretch yourself to develop new skills. If you are getting many people approaching you for coaching advice, start charging a small fee. This will help you manage your demand, give targeted attention to your clients, and push you to provide a better value service. If you have developed simple software that works well, create more complex software that solves bigger problems. If you are getting 100 visitors/day to your blog, aim for 200 visitors/day next. If you’re comfortable presenting to 10 people, then speak to an audience of 20 next. As you do this, you will gain even more XP. At one point, you level up. Soon, your “new” goals become easy for you and you are ready to take on bigger goals.